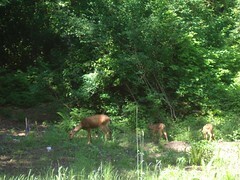 Summer has begun and a mama deer and her two fawns are grazing on the lush native plants around the field by our new Round House. We called summer in on June 15th with drumming, good food, circle songs, dances and story in the meadow. We’ve got many wonderful events happening here this summer–Sacred Fool Festival, sweatlodge, DrumJourneys Dance, Women’s Meditation Retreat with Sandy Boucher, Women’s Drumming week-end with Simone La Drumma, Spirit Quests in the woods. Click here. to read more about these events. In addition, our monthly Women’s Moon Ceremony, Wailing Lodge Ritual and Drum Circle keep happening, Check out the calendar. for upcoming events and sign up for our e-mails, which keep you posted about what’s happening here. This entry was posted in News on June 26, 2008 by theresecharvet.